Cambodia is a beautiful country, but has a side that I have attempted to bring light to. Not because I necessarily want to, but felt I have to. 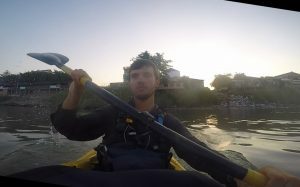 From Laos, I decided to paddle to Vietnam and document the plastic tide down the Mekong. This was my first ever expedition and I had only 6 days to plan for the 11-day expedition. I concentrated more on the logistics and how to tackle the problems I might encounter, and less on planning the documentation of the plastic problem and how I could reduce my own impact on it. I realized along the way I shouldn’t beat myself up about this as the preparation I did saved me a fair few times. The biggest regret I have, that would have cut down on food packaging, was not bringing a Tupperware box. I tried to cut down on the packaging for my food as much as possible but without the means to cook/store food efficiently, there was no point in buying lots of food before the trip. A jetboil would have been a good investment as coffee would have been greatly appreciated. But again, I didn’t want to add weight to my already heavy load, and good luck trying to find any of these items between Pakse and Phnom Penh. Instead I had to buy my food almost daily, except for when I knew I wouldn’t encounter anywhere for the day after. 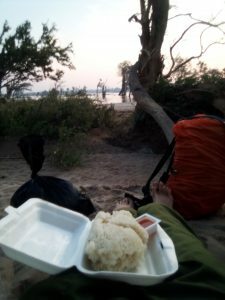 This included rice in a polystyrene box and food in little plastic bags. I know, terrible! But I reused a couple of the clean ones, which was almost as good as having a tupperware, and said no to anything unnecessary that didn’t increase the structural integrity of my food, or keep it dry. As good as it would have been for cutting down on waste, having a tupperware box would be another bulky thing I would have had to carry and wash. Spending around 12 hours on the water, and not having any daylight or tap water on land, created more hassle than I could afford if I wanted to have enough sleep for the next day. You are recommended to drink a couple of litres of water over a period of 12 hours wherever you are, but when there’s no shade in 35-degree weather you need to double that. Although I had my 1L Degbit bottle, I also needed a couple of 2L plastic bottles that I reused. These got slowly destroyed when empty and so I had to replace one. Maybe I should have had lifestraw but you can’t rely on these when the water is so contaminated. I kept all the rubbish and disposed of it as best I could in a mixed recycling bin. Again, more weight. I can understand why around the mooring sites in a town, there was so much rubbish generated by the river people. With no easy alternatives, and lack of knowledge on plastic leakage etc, the fishermen will discard all their rubbish on the bank. Any extra weight that they and their family generate slows their boat down and costs them more in fuel. There are a couple of places that they can deposit their rubbish, but these are fairly far from the river and when you are only ever on land to sell your catch for the day and pick up a couple of supplies before you return to your bed on the boat, finding a bin is your last priority. Although there was a lot of rubbish on the sides of the river, I found very little floating in the river. 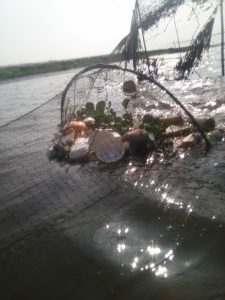 There were several occasions that I found it in mangroves, essentially acting as natural filters for the rivers, and again in fishing traps, where the only thing the fishermen caught was plastic. Hopefully this means that most of the rubbish that the fishermen make is deposited on land, but I doubt this. Regardless, I predict that come monsoon season, it all gets washed down to the sea anyway. Research is lacking in how the plastic is affecting the local fish stock and environment, but some local facilities and universities are conducting studies to see what environmental changes are happening due to human impact. I want to come back during wet season one day, and paddle from the top of Vietnam to the sea, so I can see what is coming down from the Mekong in general. I decided not to do it this trip due to the nature of the Mekong past the border and not knowing which channel of the vast delta would lead to the sea. Maybe a trip, with a sea kayak this time, would be good to explore the whole delta and find possibilities, if there are any, of how to cap the outflow of plastic into the South China Sea. The environment is a perfect condition to make microplastic, which fish and other aquatic species ingest causing harm. The language barrier is so large that I couldn’t even start, but even if I did, I’m not sure if the locals would really care. More research should be done into the local fish stock and if the decline is due to overfishing or pollution. The river people only care about the near future and don’t think far ahead, and it’s not my place to tell them to. Paddling along I saw a house that had fallen into the ever-changing Mekong. The monsoon season brings power currents that destroy the outer corner bank and deposit silt on the inner, slower side of the river. This movement of the river brings about so many problems for the riverside people. Mid water villages on stilts become land based making it harder for the fishermen to unload and load their produce. Vice versa, houses fall into the river and even if they can remain intact by becoming floating villages, it still means a drastic change for the people living there. Like the fishermen having problems with plastic waste weight, the locals have more things to worry about from the Mekong than their rubbish that they know little, nor care, about. On the second day, I came across Strung Treng, the first notable town and here the plastic problem just got worse. For the first time, I saw a plastic landfill landslide. Essentially, the rubbish gets chucked from the roadside and tumbles down the bank to sit there till the rain washes it into the Mekong, or the river rises carrying it away. I got very bored of taking photos of these and quickly realized that a clean up effort along the bank would be a large challenge due to the volume of plastic and terrain that would have to be traversed. Part of my expedition was to identify a point where a decent clean up effort would be most effective and locate a spot where the “real” issue started. Although I am not to say that the whole river shouldn’t be cleaned, just starting with an achievable goal. On day 9, for the first time, I was completely speechless at Ruessej Chrouy, 25km north of the capital of Cambodia, Phnom Penh. Here, the beach was around 2km long, completely filled with rubbish, with a couple of hundred people milling about their everyday business. With many beautifully decorated fishing boats moored to the bank, it was clear this was a popular site to sell the goods the Mekong provided. Families ate, worked and lived in this rubbish heap, but didn’t seem to mind or didn’t have an alternative. From here, as I paddled down the river, I found myself kayaking through an oil spill that covered my boat, hands and paddle. I’ve never wanted a shower as much as after paddling through that, but I had another 5 hours of paddling to go. This was a worrying sight to witness before I got to the most populated city in the country. From this point onwards, the villages were bad, towns were worse and Phnom Penh… I’m not even sure where to begin. But the particularly worrying thing was that when there were no buildings on the riverbank I still couldn’t paddle more than 5m without paddling past a piece of plastic. Ranging from full bin bags to small bottle caps, it was everywhere. All the way down to Vietnam, the problem stayed constant and almost certainly got worse further into the delta, with 30 million Vietnamese living there. 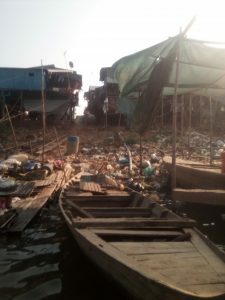 However, I’m hopeful that if a system was implemented that makes it easy to dispose of their rubbish properly, and once the locals are educated in how the plastic is destroying the local ecosystem, then the plastic tide down the Mekong could be reduced, if not stopped entirely. My summary of the plastic problem is an 11-day glimpse into the pollution along the Mekong. I hope it has brought some context to this river as one of the most plastic polluting rivers in the world. It’s easy for me to be sitting behind a screen trying to build awareness, but it’s up to everyone to bring about a change and save the rivers and seas. They will continue to be here long after we are gone and hopefully, with your help, won’t be condemned by human influence. Thank you for taking action,for communicating this, for caring about this terrible problem and for understanding that blaming the local people isn’t the solution. I’ve lived in Cambodia for 8 years,and the country has developed without any planning for ecology the environment…the people have limited access to education,so they need all the help they can get..your article is great..let’s hope more scientific research will done , and also waste awareness is taught in schools and proper waste disposal is organized by the government!